Product #6675 | SKU PROMPAII-F | 0.0 (no ratings yet) Thanks for your rating! 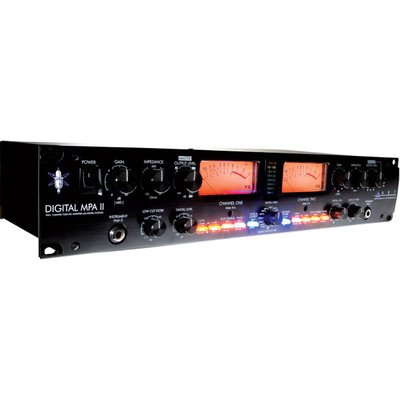 The new ART Pro MPA II is the next generation in affordable high performance microphone preamp technology. Each microphone input circuit, with selectable 48v phantom power, features variable input impedance which can radically vary the overall performance of any high quality dynamic or ribbon microphone. The ProMPA II can be configured for dual mono or stereo operation with selectable mid/side mic support, summing the adjacent channel, to decode left/right signals. The ProMPA II can operate at either a low or high plate voltage on the two integrated hand-selected 12AX7 tubes for wider variation of preamp tone and performance. Large back-lit analog VU output meters display input or output levels while multi-colored LED arrays, with average or peak hold, show tube gain.